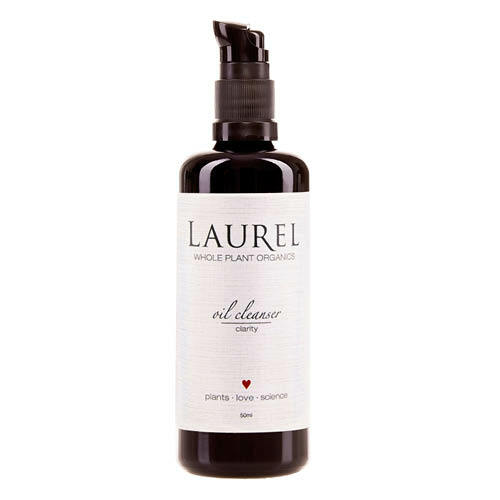 The Clarity Facial Oil Cleanser by Laurel Whole Plant Organics has 12 high quality ingredients for the perfect cleanse that leaves skin feeling deep-down detoxified. Fresh-pressed in small batches, as with all of Laurel’s products, this cleanser for acne-prone skin is 100% organic. The cleansing oils of safflower, sunflower and sesame are ideal for cleansing the skin of dirt, debris, and make-up. Blended with black cumin to keep skin looking clear, rosemary to boost a feeling of invigoration, and turmeric to make skin feel calm, this oil cleanser improves a look of balance, nourishment, and clarity. Dispense 2-3 pumps onto fingertips and apply to dry skin. Massage well around congested areas and make-up. Apply a warm, steamy towel and gently cleanse the skin. Repeat towel step 1-2 more times.